My previous beery recipe for a beery Char Sui(ish) Pork could be said to be somewhat… complicated. It’s a labour of love, a multi-stage dish designed for show & a special occasion. 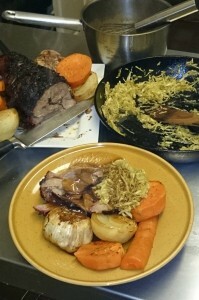 Sometimes you just want to slap together a hearty meal however – and roasts and stews are, in my mind, the ultimate bang-for-buck slap-up presentation dish. So on this wet winter evening, with a sad pint of the dregs of our Christmas mini-cask of delicious toasty-maltbomb BlackBar Porteur in front of me I was thinking roast lamb. We don’t have lamb very often despite it being my favourite of the traditional roasting meats – lamb is just so expensive. But it is that special time of year leading up to the end… or the start… depending on how you look at things. So we went and fetched ourselves a partially boned out 1.5kg rolled shoulder of British lamb. 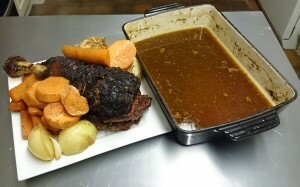 The roast itself is typically simple. Preheat your oven to 220°C. Get together some herbs, the garden is pretty scant at this time of the year but I managed to gather some rosemary, a bit of dodgy looking sage, some fronts of fennel, and a little curly parsley. 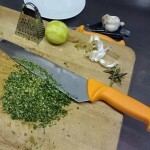 These herbs – rinsed and squeezed dry in a teatowel plus a couple of beefy cloves of garlic, the zest of a lime, and the chopped skin of a preserved lemon – are finely chopped before being pounded in a mortar & pestle with ½ teaspoon each of salt & pepper plus the juice of the lime and 4 tablespoons of rapeseed oil (or whatever you have to hand). 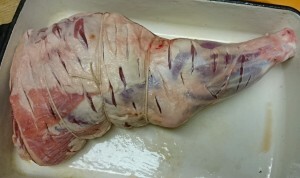 Death by 1000 cuts… that’s the treatment I give the lamb joint. Lots of little incisions just barely through the fat layer – this helps get flavour into the meat. 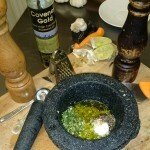 Rub the oily mixture into the lamb – give it a good sensual massage, reserving a tablespoon of mixture to place under the joint. 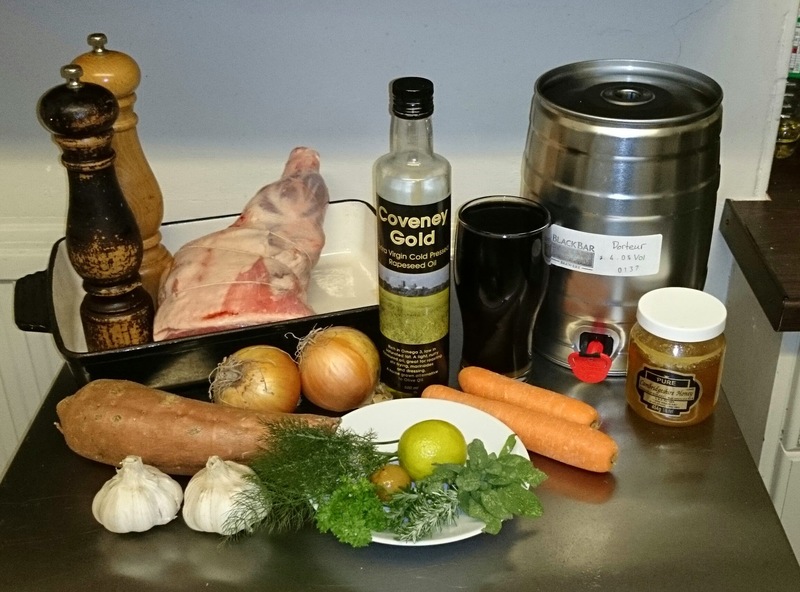 Pour the pint of beer around lamb – not over it. Place in oven and sizzle until browning – this took 30 minutes in my pathetic oven but should take no more than 20 in a good one. When the sizzle is done drop the oven temperature to 160°C, pull the lamb out of the oven and drizzle 2 tablespoons of honey over the joint. 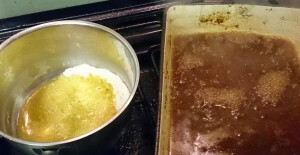 (It may help to warm the honey in hot water or a microwave to make it runny). 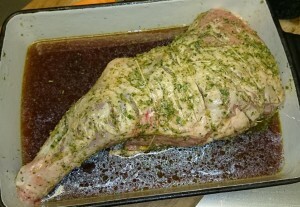 The honey should evenly glaze the lamb and catch in the little divots made by the cuts. Pop the roast back into the oven. 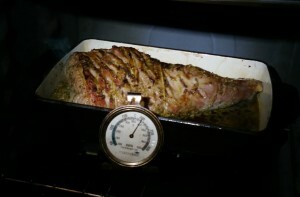 Slow-roast at 160°C for 2 hours. At this point I popped myself out to the local pub and had a couple of pints. That’s what roasts & stews are all about :) relaxing whilst dinner cooks itself. After an the 2 hours are up add your vegetables to the roasting dish, in my case: peeled sliced sweet potato, 2 whole heads of garlic, a couple of big carrots halved each way, a couple of halved onions. Baste the meat with fat from the roasting tin and then pop back into the 160°C oven for another 45 minutes – or until vegetables are tender. Done. Before the 2 hour roast we had finely sliced some cabbage and sprinkled with salt. This was set aside while the roast was happening. When the roast was removed from the oven the cabbage was rinsed with water, spun in a salad spinner, and then sizzled & softened in lamb fat from the roasting dish plus a couple of tablespoons of tarragon vinegar. 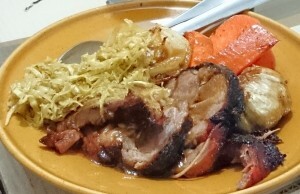 The roast joint and vegetables were removed to a warmed plate. The pan juices had excess fat siphoned off with a turkey baster and were kept simmering on the stove. In a small saucepan 2 tablespoons of rapeseed oil and 2 tablespoons of plain flour were cooked together until sizzling for a minute before the pan juices were gradually poured in through a sieve. A little at a time whisking all the way. 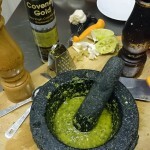 Initially it’ll seem very doughy – but once all the juices are combined in you should have a good thick gravy. And we’re done… have some warmed plates ready and serve. Enjoy with a beer. Some take-home Adnam’s Tally Ho in this case – and the BlackBar Porteur made for the backbone of a damn fine gravy. I used rolled shoulder, but leg is a luxury alternative, and if you’ve a big enough pan a whole bone-in shoulder will work beautifully. 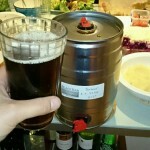 This entry was posted in "Real Ale", Cooking, Recipe and tagged BlackBar, Lamb, Porteur, Roast by Yvan Seth. Bookmark the permalink.